Yesterday the girls cut their hair. Today they did it again. Ella more so than Agatha. She had a great time cutting it. And I think it actually looks pretty good. There are a few patches that are a bit too close to her scalp and the back has a few cuts that are pretty obvious. But overall it suits her. Ryan was really upset. When she first started cutting again he started to say ‘No.’ He wanted to tell her we’d go to a salon instead. He wanted to teach her when to stop, to know when enough was enough. I stepped in. After all, saying No, really wouldn’t give her a reason to stop. But what was our reason? Because we didn’t like it so short. I asked Ryan to consider a few points. If she were 16, would we tell her she couldn’t cut her own hair. He said maybe. But when I was 16, I cut my own hair; it turned out better than when my mom cut my hair. If she were 16, would it be our place to tell her how she can or can’t wear her hair? Would it be good for her if we did? In the end she asked our opinion, and looked in the mirror. When it was all done, her smile faltered, it was too short. But it can grow again, and now she knows to look in the mirror, and keep her hair just the length she wants. It really doesn’t matter what the girls want to do, if our knee-jerk reaction is to say ‘no’, then we need to stop and examine why. Is there a valid reason, or should we step back and allow, even assist them in reaching their objective? Do we really know more about them and their bodies than they do? Maybe it’s time parents stepped back and allowed their children enough freedom to discover their own desires and limits. 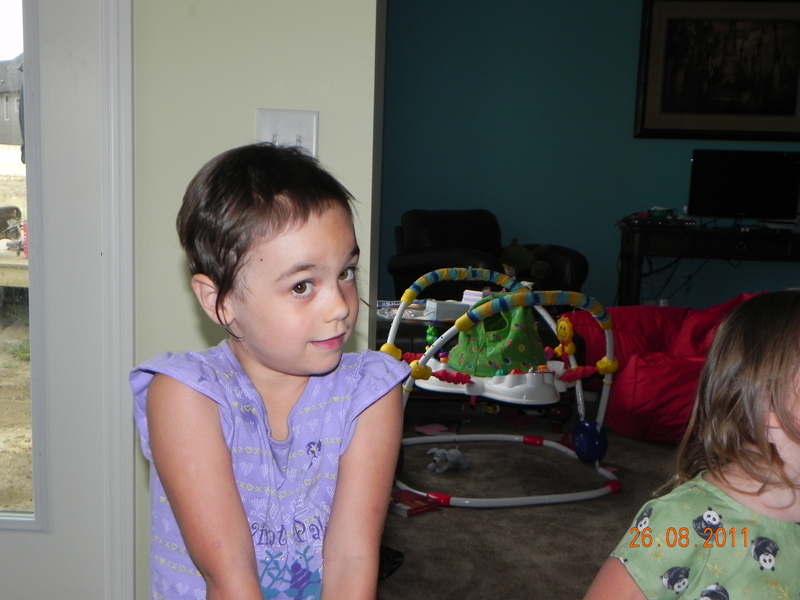 Should Ella ask permission to cut her hair in the future? Does it really matter? I did tell her we have hair scissors, and if she wanted to cut her hair, she could ask for the proper scissors. But whether to actually cut her hair or not? No, I don’t think it’s my place to either deny or grant permission. With Ella we weren’t concerned about her hurting herself, Agatha, on the other hand, is a lot more likely to hurt herself. As such the way we approach this situation for each girl would be a bit different. When writing, Ella holds the pen on her own and forms her own letters, if needed she asks for guidance. Agatha requires us to guide her by holding her hand while she makes her letters, it’s the same with scissors on hair. She wants to cut? Sure. But we’d be there holding her hand to be sure she didn’t cut an ear tip off. This is a wonderful post. I support you a thousand percent. As I see it, my job is to be my kids’ advocate and to keep them safe. A child who knows how to operate scissors (in other words, a child who’s been ALLOWED scissors with our tactful supervision, as opposed to our constant control and coercion) is absolutely ready to cut their own hair. Giving a brief warning about how difficult hair is to cut, and that you have to live with yoru “mistakes” for a while (or wear a hat), is all that I would do additionally. I think y’all did great! You may not see it now (or maybe you do), but if you parent in this manner I predict your children will have a greater sense of freedom, a greater knowledge of cause and effect and responsibility, a more developed personal style that others will envy and/or copy, and be more comfortable in her own skin – making big choices and smaller ones. Worrying about a “bad haircut” is worrying about what other people think and risks being obsessed with following the status quo – even at the expense of one’s own body autonomy. Your child will get feedback on her haircut (whether appropriate or no, whether kind or no) and will know what she wants to do in the future. Thanks so much Kelly! I showed Ella what you wrote and she said, “That’d be awesome if she copied my hair!” : ) She’s really not happy with how short it is, but everywhere she goes people complement her on the cut. It’s been a great learning experience for her in so many ways. She really is a lot more aware of her personal style now. In the sense of difficult to cut, she’d already started. To her it wasn’t difficult. Open scissors, stick hair in, close scissors. Easy. lol As for any sense of mistakes, she doesn’t have experience enough with trying something and not liking the results, and so far she’s had very limited exposure to anyone suggesting different isn’t good so that wouldn’t have changed anything. For Agatha difficult to cut, and not liking the results were more than enough to stop her after the first cut. Though we never needed to say anything to her. She struggled to cut, and one look in the mirror was enough. This is a tough one. While I believe in promoting my children’s body autonomy, I do think there’s a point at which I as a parent should give my 6yo daughter some guidelines around what she does with her body. Would I let her get her ears pierced? Wear revealing (to my eyes) clothing? Wear makeup? What about what she eats? Whether she wears sun protection when she goes out? I actually do think I know more about her and her body than she does. At the very least, I have a different perspective than she does, and I have a better ability to see the big picture and the long-term ramifications of her actions. I don’t think setting limits tells her that she can’t be trusted with her own decisions about her own body; rather, I think it helps her understand that there’s value in taking some time and consideration, weighing our options and looking at a situation from multiple angles before we choose a course of action. And that sometimes it’s better to defer to someone who has more training (and who can reach the back of our head better than we can). It’s not about an arbitrary age of consent. It’s about knowing our children and allowing them to make choices as it’s appropriate to their age and abilities. You made the choice that was right for you as the mother of your specific children, but I disagree with the suggestion that, had you not allowed them to cut their own hair, you would be somehow stifling their freedom, or that stifling their freedom would be automatically bad. Parents limit their children’s freedom every day. It’s part of our job, and when applied with love and prudence, it’s healthy and shows our children that we love them and will keep them safe. Can I envision a scenario in which I might let my daughter cut her own hair? Yes. But it would involve a lot of time, thought, discussion, and encouragement to her to do more research about the process before I’d hand her the scissors. If she asked me, I’d likely say not “yes” or “no,” but “Wait; let’s talk about this.” There are good reasons to either grant or deny her permission to cut her own hair, but it takes time to determine if these apply to the situation at one particular moment. It seems we differ in a number of ways. When Ella was 3, she wanted to get her ears pierced. I said sure. She wanted to know how it was done, so I explained it to her, and we watched a video, then we talked to someone who recently had it done. In the end she decided not to get them pierced, but I never presented any of the information to her. It’s her body. I have my ears pierced so really can’t give her a valid reason not to do it. There have been times when we’ve gone out where the clothes she choose were, IMO, less than flattering, and a bit more revealing (dress too short) than I’d like. However, there was nothing wrong with the clothes, they covered everything they were supposed to. If she wants to wear make-up, she can. I wear make-up on occasion too. When I do, she usually wants to also. It’s not an indication of a negative self-image, but rather an indication she wants to be like me. I really don’t want to tell her being like me is wrong. I’ll admit, I buy our food. As such I don’t spend all our money on candy. But we have very few restrictions on food. Our restrictions, as they are, are based on wastage, not on value of the food. Yes, we have a different perspective than our children, but that doesn’t mean our perspective is the best one. Not everybody wants to, or needs to look at something from more than one angle. Some people can look t all those angles faster than others. 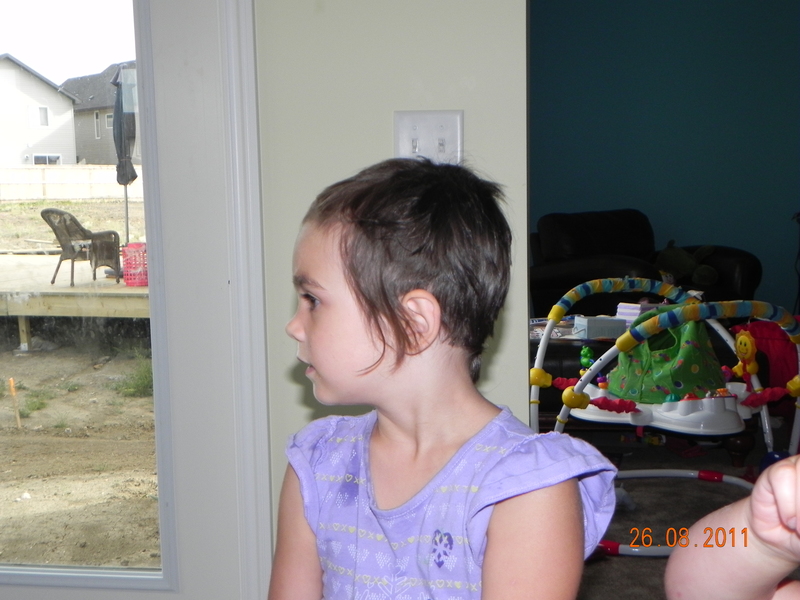 Ella wanted to cut her hair, I asked her what she hoped to accomplish, she told me she wanted short hair so she didn’t need to wash it or brush it as much, and she didn’t want ponytails anymore. Nothing I’d be willing to say could change that. We’d discussed her hair in regards to hygiene before, we’d brainstormed before. This time she chose a different course of action. I believe that by allowing them to try things for themselves, they’ll become better able to know their own limitations, and know when they need help. At this age Ryan or I are available pretty much all the time. We’re there to supervise and keep them safe from major harm. But one day we won’t be. I want to know that by the time they’re off on their own, or with friends, that they’ll have experience making decisions. Part of making decisions involves learning what the consequences could be. If I spell it out for them, they really don’t learn it for themselves. I really hope I’m not limiting my children’s freedom everyday. That doesn’t mean they can do whatever they want, when they want it. After all, they live in a house with five people who all have different needs. But being respectful of others doesn’t mean we have to limit their freedom. If one of my children wanted to go sky diving, or get a tattoo, then we’d suggest they do their research. We’d say let’s talk. But both of those could effect their entire lives. They involve lasting consequences. A hair cut involves three weeks of consequences, less if a salon visit fixes any unwanted results. lol – reality is very different. It’s easy to look at a situation and know what you’ll do…until it actually happens. But thinking about it, examining your feelings allows you to find the response that’ll be the set for you and your daughter. I’m with you, I have an 8 yo and a 4 yo. They have both had dreadlocks, short hair, salon cuts. My 8 yo does a good job of cutting her own bangs. They have had Choices all along. Same with food, clothing/makeup, etc. I don’t see why they shouldn’t be allowed control over their own appearances within hygenic/appropriately-covered-body-parts limits. Kids love to play dress-up, I let them extend that to hair and makeup. Thanks for stopping by! It’s great to hear from a mama who follows a similar path. I guess the real question to follow the comments that have been made previously is “How do you determine when a child’s freedom is impeding on others or at least having a negative effect on others and how do you limit these behaviors in a way that still allows them to feel they aren’t being limited?” My son likes to draw on the sidewalk with rocks. That’s fine. The other day he decided to draw with the rocks on our van. All the way around it. I like to let him feel like he can play outside without me hovering, and I needed to fix dinner so I was not watching him. It will cost a significant amount of money to repaint our vehicle. He’s not quite 2 1/2, so I don’t know how much he understands that he can’t do something that will damage others’ property. I don’t want to limit his relatively unsupervised playtime outdoors but I also don’t want the next car he draws on to be the neighbors’. As an aside, I’d like to point out that your examples of sky diving and tattooing aren’t really relevant, since generally speaking tattoo shops and sky diving places have certain age limits that they have to adhere to for insurance purposes. So in that sense, you’re sort of protected from having to limit them from those activities – others do it for you – until they’ve reached the age of consent for the activities in question. I’m not sure what is a good example, though. It can be difficult to figure out the balance with small children between freedom, and protecting others or other’s property. As for sky diving or tattoos the age can be waived with a parent or guardian sig. However the point I was trying to make is that something that can result in life long consequences or something that could result in serious bodily harm or death would have me step in, but the little things in life will typically have me stepping to the side and watching rather than actually offering input (unless that input is asked for).